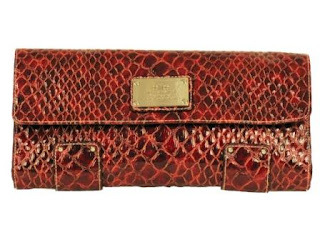 Congrats to Naomi for winning the Elite Models' Croco Embossed Clutch in Red that I recently spoke about on HSN. I'm sure you'll love this affordable fashion find. The week before I left for HSN, which now seems like a million years ago but was really about 12 days ago, Glam.com invited me and Michelle to attend a fashion event at the Levi's store in Union Square. Being that I'm a denim idiot - i own about 3 pairs, all of which were gifts! - I thought it would be educational. Michelle, of course, showed up in vintage Levi's. I was there in my usual look of dress, stilettos and pashmina scarf. With a $100 gift card I really wanted to get a pair of jeans and the sales girls tried so hard. I tried on fabulous jeans including these Trouser Flare Jeans, mostly because they reminded me of pants. In the end I went with a cute cropped, sweater with one button closure that will look angelic over my dresses, and this skinny belt. I still have about $40 left on my card and I'm thinking I'll try something new. I'm going to buy those trouser jeans after all. It would be nice to at least have the option to wear them. 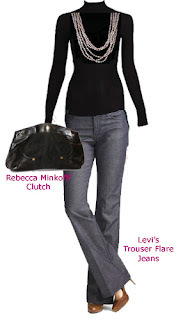 Perhaps I'll pair the jeans with a black turtleneck, strands of pearls and a nice clutch -- chic, no? Three postings in one day - quite a lot for me. Must be the crisp fall air that has given me a BURST of energy (or maybe it's that nice kiss I just got for from my fiance!) In any event, in case you missed it, take a look at my Fall Handbag Trends For Less report for AOL's Stylelist.com. I'm their go-to-gal for all things bags. Right now I'm wrapping up a celeb handbag story focusing on great work/day bags. And, yes, it will be for less. It's all about recession happy prices because even during these hard times we still want to look good and be in vogue. 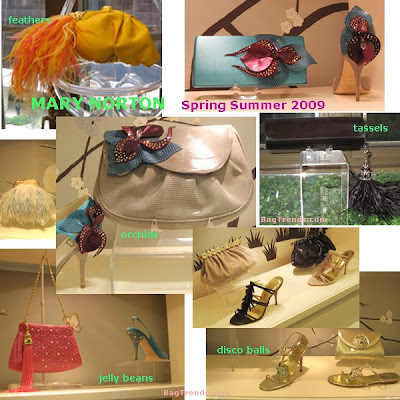 Click here to preview Mary Norton's Spring Summer 2009 collection. It was a crazy week of flying, handbags, and fun. Now that I’m back from Florida and well rested, I wanted to catch up and share thoughts on the many previews I’ve attended over the past week. On Tuesday I had the pleasure of checking out the Spring-Summer 2009 collections from two of my favorite lines - Mary Norton and MCM. Mary was first at 9am. I love coming in to see her (we get to see each other about four times a year in NY, though I’m forever promising to come by her shop and headquarters in South Carolina.) She’s a true lady, always prim and proper, well quaffed, tailored skirt. The first time we met, Mary’s left arm was in a sling – never has any woman looked chicer in a sling. “Chic in a Sling” – that should be a trend piece :) and we can see how many gals can really pull it off. But, I digress - as usual. The Bags... The assortment of evening bags were phenomenal. The inspiration for spring is the five senses, and certainly all of mine were on overload. Of course SIGHT refers to all the bags (because, well, you can see them – ya not the best one). Then there was a group for TASTE, particularly influenced by candy. Cotton candy colors of fuchsia, yellow and orange or sky blue, lavender and white are found on Mary Norton’s signature feather bags. Jelly bean prints are found on small chain purses and shoes. (The jellies didn't gel with me - not my favorite grouping, to be honest). TOUCH is evoked in fun tassels, that Mary is now going to make a signature piece of her collection. There were tassels inspired by the empire state building, jelly beans and with feathers. For SOUND, 80’s disco balls and record-like print embroidery was used. Finally, my favorite group and inspiration was leather orchids which referenced SMELL. Take a look at the images, are they not to die for? Prices will kill you too, but this is the quality work produced in Italy and supervised by the marvelous Mary Norton herself. Enjoy the images below. And, let me know what you think. Oh and check out the newly revamped MaryNorton.com – they have ecommerce. You can also get Mary at Saks.com. My next post will be about MCM ... stay tuned. In just a few hours - less than four to be exact - I'll be live on HSN chatting about trends and Elite Models' Bags. 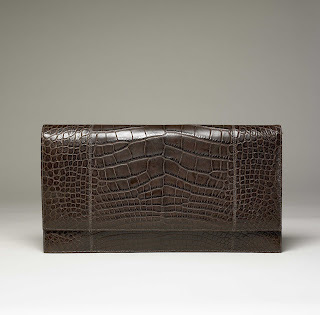 You can win the Elite Croco Embossed Clutch in Red just by commenting on my blog post from Monday. Tell me what you think - even as you watch!! On Thursday, October 23, from 6 to 8 pm, Saks Fifth Avenue and W magazine invite you to the newly renovated handbag boutiques at Saks, featuring Bottega Veneta, Dolce & Gabbana, Fendi, Prada, Salvatore Ferragamo and Tod's. They have all kinds of exciting things handbag that day including a change to win a Fall 2008 bag from each designer. Oh, what I would give for a Bottega Veneta bag. PS Steve, my dear, if you're reading this (and I know you are!) I still don't have a Bottega bag in my repertoire. Certainly, that can't be good! RSVP to (212) 451-3942 or wevents@condenast.com. I'm excited to announce that this coming Wednesday, October 22nd, I'll be back on HSN, The Home Shopping Network, to chat up fall and holiday trends. This time, I'll be focusing on Elite Models' Handbags, It's an hour show with me. I'll be talking about current trends and Elite Model's Handbags. There will be lots of bags - satchels, hobos, shoulder bags, clutches and more all at recession-friendly prices - translation under $75. The faux croco-embossed clutch in red - they call it red, but it's really a berrylicious mix of colors. The color also comes in silver and black. This is a great holiday gift for just $29. 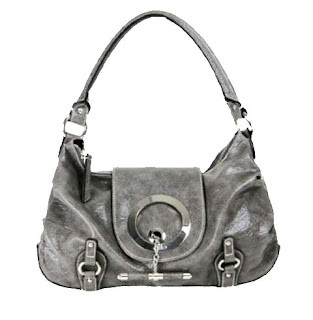 The slouchy hobo with toggle in grey. I like the hardware detailing and how the silver-grey. There's the security of a zipper opening - a must for my work bag! Finally, the shoulder strap drop - 10" - is perfect for getting over a jacket. 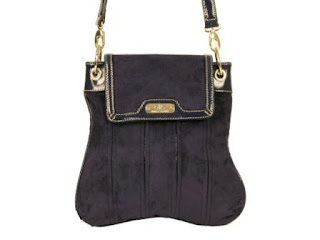 This bag also comes in plum and black, and will be $$59.90. The pleated crossbody in navy. It's my "fashion" pick because I know this style doesn't work for everyone and not everyone can wear it well. I like this look for a mom who's taking the toddler to the park - you can pit some essentials like money, tissues, band aids and other money stuff that you need to get to asap. I also think this looks better on taller girls and probably on the skinnier side - sorry girls some bags are not made for all. At 5 feet, a messenger really wouldn't look as fab on me as it would on someone over 5"5'+. If you shorten the strap, maybe - but it really should be sitting slightly below your hip. About the brand: Elite, The model icon's agency introduced its first handbag line in the USA in 2007. Every season our priority is to create a success story with new styles, trendy colors, fashionable materials and carry an unprecedented range of glamorous handbags. Price ranges retail from $40 to $100. What a crazy day. It started off with a bridal appointment at Mark Ignram Bridal Atelier. On the way to the city I got a call that I've been booked for a "Finding Money in Your Closet" segment on CW11. Tune in at 7:40am and 8:40am (more details tomorrow!!) Back to the salon, which was amazing. Ambiance, customer service, and an exquisite selection of bridal gowns. I may not have found the dress yet, but I found the bridal salon. Evey bride needs to go here! Next it was off to a meeting with an agency that shall remain nameless - they help me with all my contracts and big projects. It was exciting to discuss what's on the horizon for the coming months!! Then, it was back to my makeshift in the city where I needed to hustle to find people to take part in my CW11 segment. 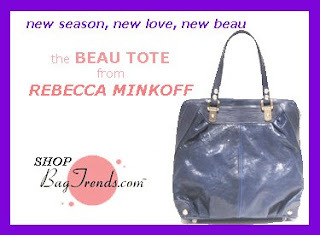 I also had just enough time to wrap up November's Top 3 Trends for BagTrends.com, sign a contact with HSN (yup I'm back October 22!) and connect with my bagtrends team. The evening capped off with MyItThings.com's It DESIGNER contest finale. The event, hosted by Mary Rambin (who used to design MOE Handbags) was wonderfully executed - great wine from Casa De Vinos, yummy hors d'oeuvres, music, and then there was the show. All three designers did a nice job - first was Adolfo Sanchez's "angelic, heavenly looks", Nora Del Busto's "reinterpretations of traditional Peruvian costumes" and Wakana Koike's "marine influences". Koike won in my book and the judges!! Congrats. When viewing the below images note that the prints are custom made by a Japanese ink-jet factory, according to Koike's specifications. In the famous words of Heidi Klum ... "enjoy the show." Take advantage of the economic meltdown as stores try to clear out inventory asap and make room (and $$$) for holiday merchandise. Shopbop just added new styles from Marc, Rachel Pally, Ella Moss, C&C, Alice + Olivia, and more, and it's all New Markdowns 30-70% Off going on right now! Friday's Bag-a-licious Pick comes from HSN and it's under $50!! Read about all goodies in BagTreats Gift Bag during our recent BagTrends Arm Candy Party. And, learn how you can WIN A GIFT BAG too!! Leighton Meester talks bags and shared In Her Bag secrets with the BagTrends Beauty Editor Sabrina Newman.